Has Wikipedia Beaten Britannica in the Encyclopedia Battle? Microsoft's search engine Bing announced a partnership with the Encyclopedia Britannica Thursday to integrate information from the old school reference work directly into the engine's search results. Britannica results contain key information about the target of a search, as well as links to websites with more information on it. A search for Spinoza, for example, will include a Britannica "answers" result that includes a summary of who he is, his date of birth and religion, as well as links to more info on him at Wikipedia, Britannica, Freebase, and Qwiki. While Britannica results contain special formatting, they don't receive special treatment on a results page. So in the Spinoza example, for instance, the Britannica results were fourth on the page, trailing Wikipedia, the Stanford University Encyclopedia of Philosophy, and the Internet Encyclopedia of Philosophy. Britannica results don't show up on all searches. In fact, their absence can be surprising, as a search for Descartes revealed. An answers box for Spinoza and none for Descartes seems a bit odd. Bing's addition of Britannica answers to its search results continues a trend set by Google to incorporate "nutshell" information in search results. Last month, Google introduced Google Graph, which displays key information about a search target beside its search results. Searching for Spinoza with Google, for instance, displays a block of information about the philosopher in a "well" beside the search results. 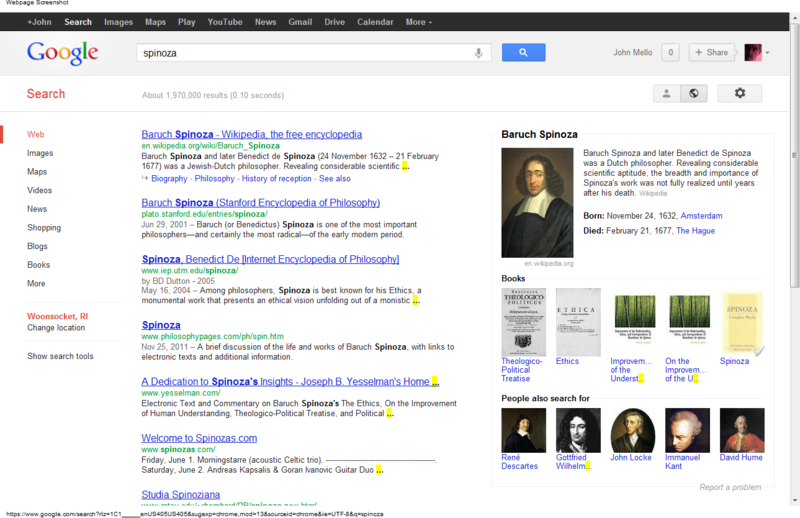 The information includes a thumbnail of Spinoza, a summary of his importance, birth and death dates, thumbnails of his books and thumbs of related searches. Not only is Google Graph attractive to the eye, but its prominent placement makes it easy to find on the results page. To find Britannica answers on a Bing results page, you really have to hunt for it. Britannica answers is a good idea, but Bing should find a way to better showcase the feature and, perhaps, expand the information in it.